Baseball may be America’s pastime, but mini golf is a close second. Who amongst us doesn’t have fantastic memories of afternoons with family or Saturday evenings with friends? Next time you’re ready to make new mini-memories, consider the following 10 spots in Oregon. Next time you’re in the mood for an incredible blacklight mini golf adventure, stop in to either the Portland or Beaverton locations of Glowing Greens Mini Golf Blacklight Adventures Oregon. With reasonable pricing and free golf on your birthday, Glowing Greens is the perfect spot for your next party, corporate gathering, or night on the town. Eagle Landing Golf Course offers “nature inspired” 36 holes of miniature golf, in addition to its many other golf offerings. According to its website, “Eagle Landing’s scenic Miniature Golf Courses…strategically curve in and out of trees, waterfalls, fountains, mountains” and more. 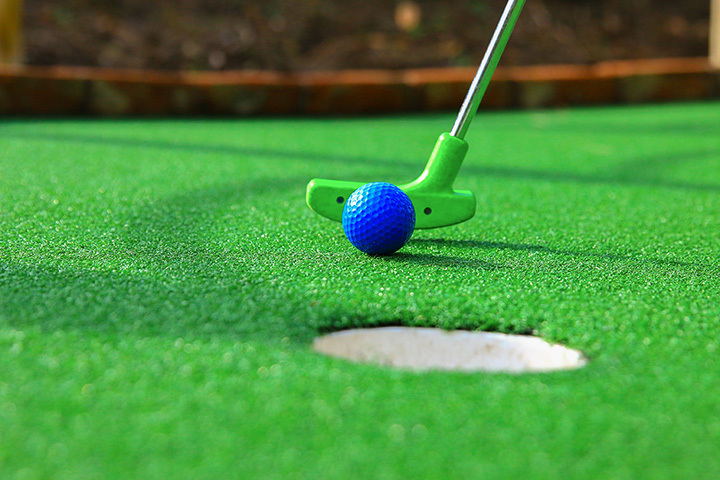 PuttSkee’s Mini-Golf is great for large or small groups. Games are only $3 a person, making this one of the most affordable options on the list. Check their website for group and party options, too. Lake Shore Lanes offers bowling, cosmic bowling, arcade, and miniature golf. The outdoor mini golf course includes 18 holes. Consider a birthday package or the “Morning Get Away” package, which includes coffee and a fresh baked pastry. Sah-Hah-Lee in Clackamas, Oregon offers golf options for any skill level. Their mini golf course is only $5 for adults and $4 for children 15 years-old and younger, with a 20 percent discount on groups of 8 or more. According to their website, they have recently added sandtraps, undulations, and sneaky breaks to make the course even more entertaining. Matterhorn Village overlooks the gorgeous Wallowa Lake and is the perfect destination for your next vacation. Their 18-hole premier golf course, called Mt. Pines Adventure Golf, provides fun for the entire family. Pietro’s Pizza has four Oregon locations and mini golf is available at its Beaverton and Salem spots. While their main claim to the fame is their pizza, Pietro’s is anything but a normal pizza shop. They’ve got tons of on-site games including laser tag and pirate-themed mini golf. Oaks Amusement Park offers roller skating, amusement park rides, carnival games, and mini golf. According to their website, “playing a round is a perfect way to cool-off, slow down, and connect with the ones you love.” We couldn’t have said it better ourselves.